which is around his neck. 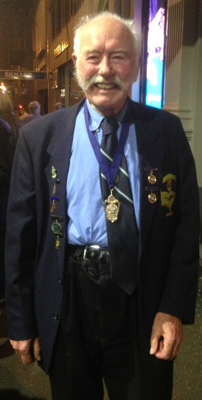 Long time member of Croydon Citizens' Bands Ian Douglas has been awarded the 2014 Royal South Street Society (Ballarat) Frank Wright Medal in recognition of over 40 years of service to Victorian Community Bands. South Street makes the award on the recommendation of the Victorian Bands' League (VBL). It honours famous Ballarat musician Frank Wright who conducted bands in Ballarat before an illustrious career in London as a Professor at the Guildhall School of Music and as Director of Music for London County Council. When conferring the award at the Victorian State Band Championships in Ballarat, VBL President Megan Stapleton told the audience that Ian has been President of Croydon Citizens' Bands for 24 years, and has served on the VBL Executive for 35 years, with a total of eight years as President. He is currently a VBL Vice-President, and still plays in several bands. In accepting the award, Ian said that he had not realised as he walked through the door of the Croydon band room 42 years ago how much change that action was going to make to his life! He remembered how proud he was to first receive the VBL Badge of Merit, then later the Badge of Honour, and ultimately Honorary Life Membership. He paid tribute to the contribution that Melva, his late wife of 49 years had made with her support to make it possible for him to put in so much time and effort into banding. Our 2014 recipient started his banding life in the Croydon Wind Symphony in 1972. As a self-taught player, he flourished in the band setting and joined Croydon Citizens’ Band in 1975. From 1975 – 1980, the Croydon Citizens’ Band went from D Grade to B Grade and our 2014 recipient went from new player to committee member and Drum Major. As Drum Major he led the band at National Championships and State competitions in addition to numerous local events. In 1981 he became President of the Croydon Citizens’ Band and served for 2 years. After his initial term as President, the band went through some rough times and by the time he was elected as President again in 1989, the Brass Band was down to about 4 regular playing members and was at great risk of extinction. Never one to give up, he persisted right through the 90’s, determined to keep the band running. For a short period he even took on the role of MD! In 2002 he proudly continued to lead the band as President during the Brass Band’s 40th Anniversary year. After a tough decade, the band started to find its feet and began to grow again. Today the band is flourishing, with a large dedicated membership base and plays an active role in both within their local community and at state competitions. Throughout his years of involvement with the Croydon Citizens’ Band, the Croydon Wind Symphony and the Croydon Concert Band, he has not only developed his own playing, but inspired future generations of musicians. He mentored young developing players and worked tirelessly to promote the band to the wider community. In addition to the role he has played in the Croydon banding scene, he has also played a significant role as a member of the Executive of the Victorian Bands’ League. He has been a member of the Executive for over 30 years, including a long stint in the role of President. During this time he steered the VBL through many difficult moments, never letting overwhelming odds stop him from achieving his goals. He chaired nationals organising committees, served on the Drill Advisory Board and until recently ran the VBL website. On top of this were hundreds of volunteer hours at competitions, meetings and events. He handed over the role of president in 2007 with the VBL in a healthy financial situation and a strong committee to lead it. Many would sit back and rest at this point, but not our recipient! He continued to serve as an Executive member, a role he still holds today. It gives me great pleasure to invite our 2014 Frank Wright Medal recipient to the stage, Mr Ian Douglas. © Copyright 2011-2015 - Croydon Citizens' Bands Inc. All rights reserved.